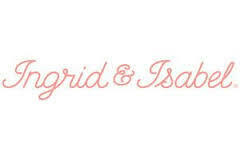 Ingrid and Isabel is a fashion boutique that specializes in stylish options for maternity clothing and nursing clothing. You can start your experience with the website by signing up with their informative newsletter via email. This also allows you to save 15% on your next order. Both free shipping and free returns are always offered on the site, as well. You can shop according to such categories as dresses and jumpsuits, pregnancy essentials, and sleepwear. You can also shop for certain occasions, such as clothing for vacations, clothing for work, or clothing for baby showers. You can also find inspiration and information by visiting their blog.